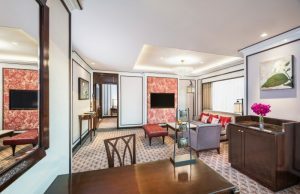 Bangkok (Thailand) – September 11, 2018 (travelindex.com) – The Athenee Hotel, a Luxury Collection Hotel, Bangkok is celebrating the 1st anniversary of its rebranding as a Luxury Collection hotel with a special thank you package “The Athenee Anniversary” featuring its luxurious suites and a complimentary celebration for guests who also celebrate their birthday in October. – Early Check in at 10:00 A.M. and late check out at 04:00 P.M.
Special for guests who celebrate their birthday in October, a specially baked birthday cake and two glasses of champagne during their stay with the compliments of the hotel. Prices start from THB 19,000++ per night for Athenee Suite. Bookings from now until 31 October 2018 for stays from 1 -31 October 2018.